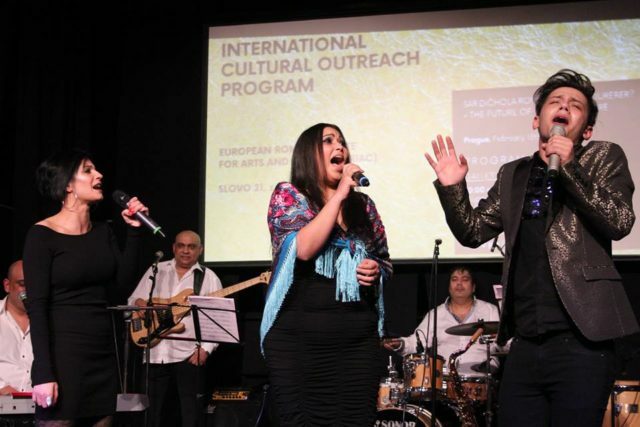 Within the framework of the ERIAC International Cultural Outreach Program, ERIAC, in partnership with Slovo 21 co-hosted the event “SAR DIČHOLA ROMAŇI KULTURA DUREDER – The Future of Romani Culture”, which took place on 13 February in Prague. The programme of the event included an international conference and evening cultural program. 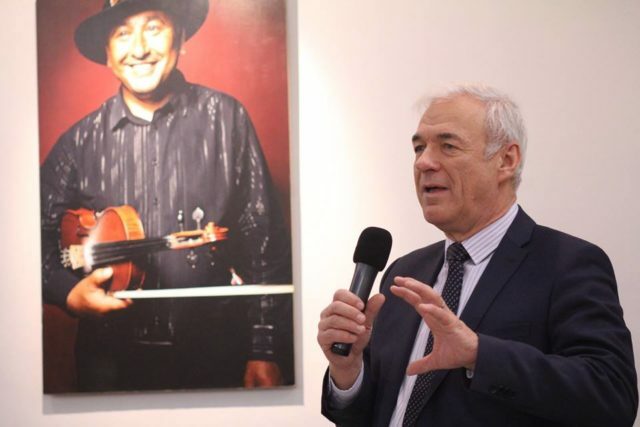 The International Conference entitled “Supporting the Development of Romani Culture: Present Challenges and Opportunities for the Future” took place at 10:00 at the Gallery of Czech Centres. The gallery is located in the historical part of Prague and is a place for mutual encounters and the interconnection of culture, creativity and national identity; it also offers space for novice and renowned artists. For the occasion, two photo exhibitions were presented in the venue which accompanied the conference. 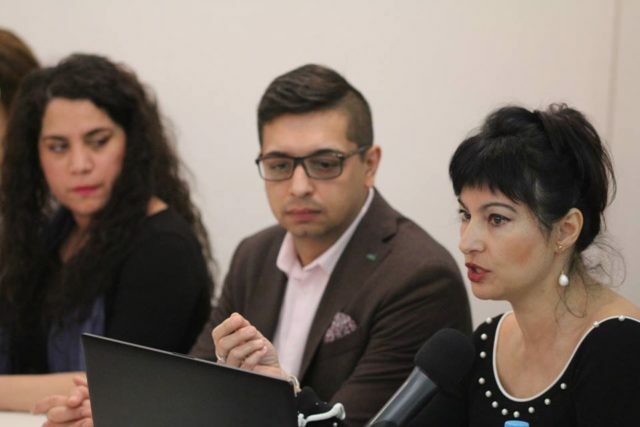 Within the framework of the Prague conference, the participants focused on the presentation of Romani culture in the Czech Republic and abroad, discussed the challenges and obstacles associated with the financing of Roma cultural projects and future development of Roma cultural heritage. 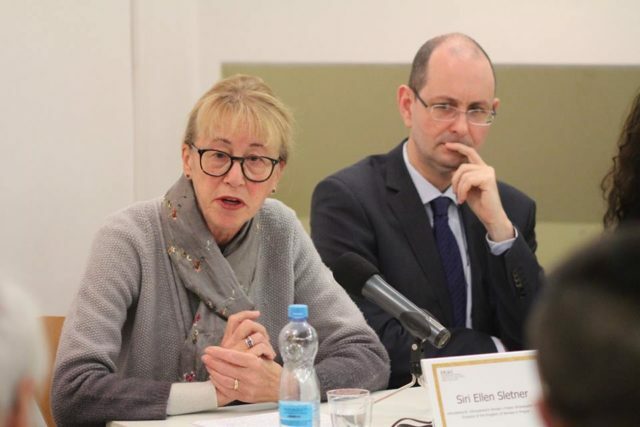 The conference was inaugurated by Dr. Anna Mirga-Kruszelnicka, the Deputy Director of ERIAC, Mrs. Jelena Silajdžić, the Director of Slovo 21, Ambassador of Federal Republic of Germany Mr. Christoph Isrand, and Ambassador of the Kingdom of Norway, Mrs. Siri Ellen Sletner. The conference counted with the participation of the Minister of Culture, Dr. Ilja Šmíd, the Prague City Councillor Mr. Jan Wolf, and Mr. Martin Martínek, Head of Government Council for Roma Minority Affairs Unit and Secretariat of the Government Council for National Minorities, who underlined their continuous support for Roma cultural and artistic initiatives in the Czech Republic. 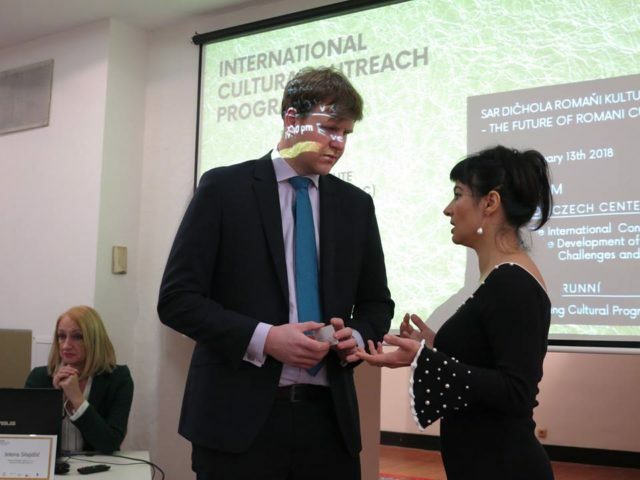 Besides the governmental representatives, there were many organizations and NGOs, who represented important Roma cultural projects in the Czech Republic. David Tišer presented the work of the Roma NGO ARA ART. Zdeněk Ryšavý talked about Romea and their magazine Romano Vodi. Ivona Parčiová from IQ Roma Servis presented Amaro records, the recording studio for Roma artists. 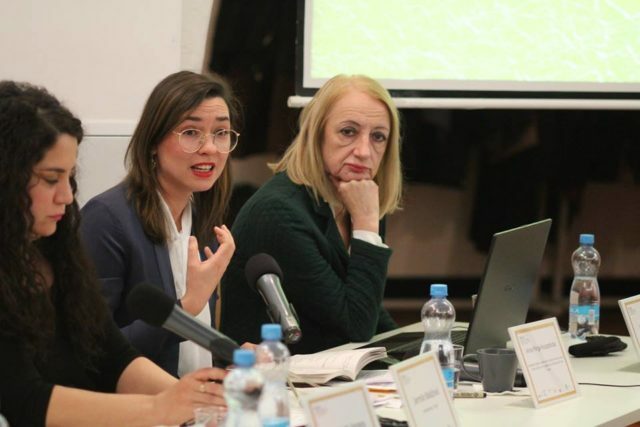 Dr. Jana Horváthová talked about the Museum of Romani Culture and Pavlína Matiová presented the work of Slovo 21 and their Khamoro Festival, the biggest Roma festival in the world. There were also guests from abroad, who presented interesting cultural projects. Magdaléna Rothová from Slovakia introduced Roma Spirit, which is annual awards to the Roma living in Slovakia. Amet Jasar from the Netherlands, the Vice-Chairman of the Advisory Committee Sinti and Roma from the Ministry of Health, Welfare, and Sport described the system of financing of Roma cultural projects in his country and how Roma can apply for grant calls. 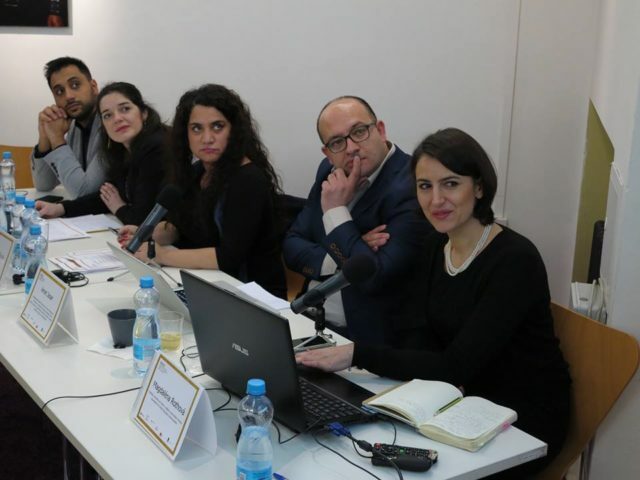 Karolina Mirga Danek presented the work of the International Roma Youth Network ternYpe. The last guest was Marian Olivian Mircea, coordinator in Mesteshukar ButiQ, the social enterprise working on revaluing traditional Roma craftsmanship based in Bucharest. The conference was followed by the evening cultural program for the public, which took place at 19:00 in Divadlo v Korunní, a renowned theatre owned by famous Roma politician and activist Emil Ščuka. The theatre is part of the International Conservatory of Prague, from which the most important Roma artists from all over the Czech Republic come from. During the evening, visitors could taste a variety of Romani culture in all its forms such as music, singing, poetry, performance, alternative art and more. The evening began with Renáta Berkyová, a well-known poet and prose writer. The audience could also see Peter Balogh, a young violinist from the International Conservatory and Milan Kroka, a composer and singer who is one of the most significant musicians of the Czech scene. The next performer was the famous singer Jan Bendig, participant of the Czech Slovak SuperStar competition. In recent years, Jan has been working with many artists and is very successful both in the Czech Republic and abroad; his latest videos have millions of views on Youtube. 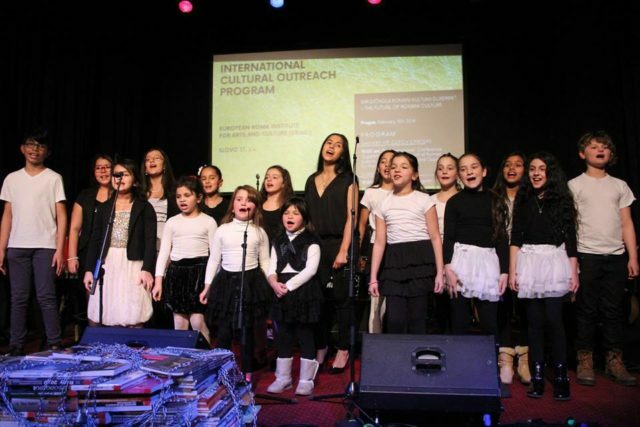 Other performers were Pavlína Matiová and Marta Balážová, young Roma singers and actresses. They are both members of Roma theater group ARA ART, which is based in Prague. Since 2012, they have been working on the Prague musical scene. 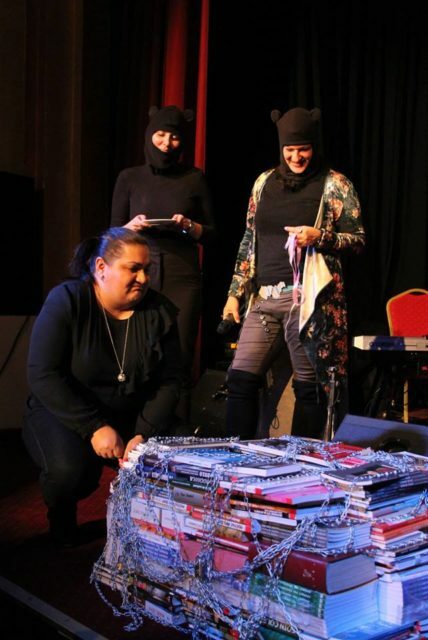 The audience could also engage in an interactive performance by Romane Kale Panthera, alternative art group of Roma artists from the Czech Republic. The program was concluded by a reception.